The Delilah singer will perform at the city's Slessor Gardens on Saturday July 27. Legend: Sir Tom first found fame in the 1960s (file pic). Legendary singer Tom Jones will play a concert in Dundee this summer. The Delilah singer will perform at the city's Slessor Gardens on Saturday July 27 as part of a three-date UK tour. Sir Tom first found fame with a string of hits in the 60s and has sold more than 100 million records in his career. 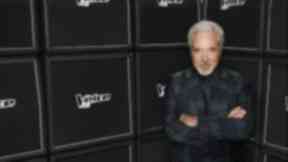 Since making a comeback in the 1990s, the singer has gone from strength to strength, receiving a knighthood in 2006 and serving as a coach on The Voice. Fans have been promised a collection of Sir Tom's biggest hits across the decades at the Dundee show. Promoter Liz Doogan-Hobbs said: "We are delighted to be working with Tom Jones once again. "He remains one of the most popular artists in the industry and truly captivates his fans whenever he takes to the stage. "Dundee is a vibrant place and we are certain that the concert is going to be greatly welcomed in the city, promising an evening filled with Tom's most recognisable and popular hits. We are looking forward to seeing all his fans there."